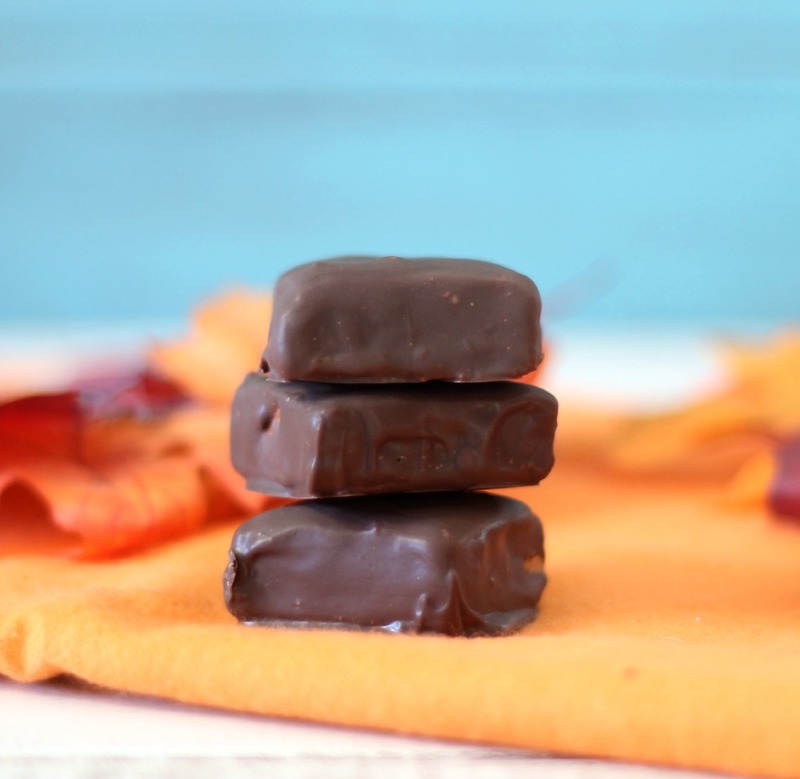 Today I have for you a Halloween treat that is sure to please peanut butter lovers everywhere. 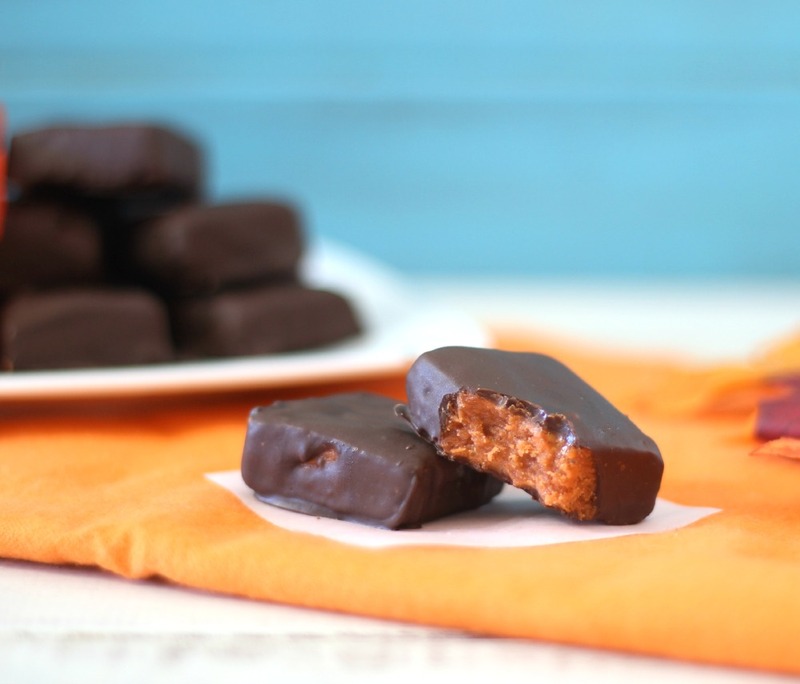 I have made a copycat of one of my all time favorite candy bars; the Butterfingers! 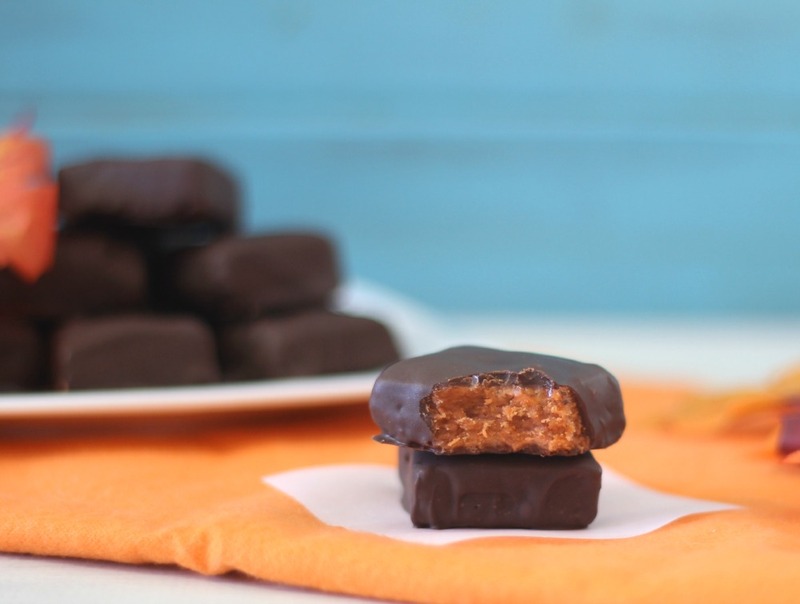 Ohhhh, how I love that snappy little candy bar, that is covered in chocolate and filled with a peanut butter middle. I was inspired to make these bars from the leftover candy corn that I had from my Pumpkin Snack Cakes. I figured I should use them up before I keep eating the candy corn. Funny as a blogger, you buy something for a prop and then you don’t use it, so I’m using my prop today and boy what a great idea. These little candies taste just like Butterfingers. They have a crunchy peanut buttery center that was dipped in dark chocolate. Now of course you could use milk chocolate just like the traditional candy bar. To make the recipe it is so simple. Just melt your candy corn in the microwave, stir in peanut butter and place in a baking pan to chill. Once they are chilled, cut the bars into any size you want. I started out with stick shapes than went to square. I kind of like the look of the square better. I got 45 pieces of candy out of one batch, but again it depends on the size you cut the bars. I went with a traditional candy size. There is one thing to know is that the bars can be tough to cut. I used a sharp knife than a pizza cutter to try to make it look more evenly. If you make these with the kids, be sure you do the cutting. 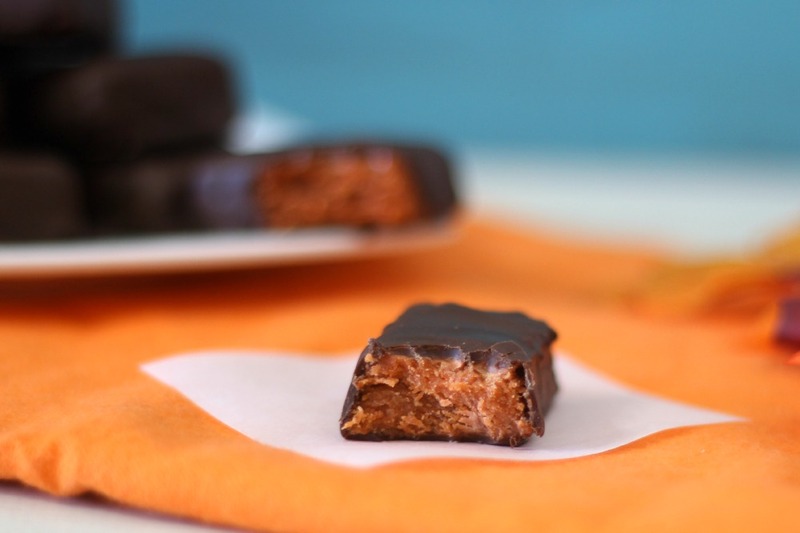 A copycat recipe of a Butterfingers Candy Bar made with candy corn, peanut butter and chocolate. Line an 8 x 8 baking pan with parchment paper; set a side. In a microwave safe bowl, add candy corn. Cook for 1 minute, stir, cook for 30 seconds, stir, then cook in 15 second intervals until creamy. Add peanut butter, mix until combined. If the candy starts to get hard while mixing, place in the microwave for 10 seconds. Pour mixture into prepared baking dish. Smooth out with a back of a spoon. Place in the refrigerator for one hour to cool. Take candy out of the refrigerator, and place on a cutting board. This part gets tricky. Using a sharp knife cut into pieces. You can make any shape and size you like. Make a double boiler, by placing water in a medium pot, about a ⅓ of the way, place a large glass bowl over the pot and add chocolate. Stir the chocolate until melted. With two forks dip candy mixture into chocolate. Place the candy onto parchment paper and let it set. Store candy in an airtight container in the refrigerator for a crispy bar or leave on the counter for a chewy bar. One thing to note; the candy is crunchy if stored in the refrigerator. It is chewy if left out on the counter. 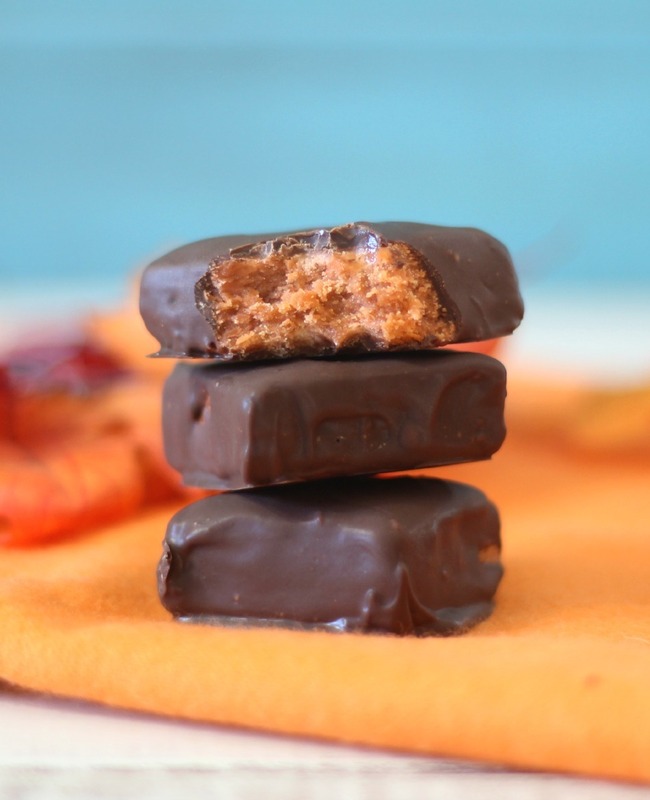 So next time you have leftover candy corn, make a batch of Butterfingers. It’s so simple and taste amazing. I can’t get over how much it really does taste like a Butterfingers. I’m off to the boss’s house for a Fall BBQ today. I hope you have a great weekend! Thanks for all your great ideas and inspiring posts! I love your good mood, which I need help with on many days! Have a great weekend and keep up the good work.. I cannot get over the fact that you can use candy corn to make butterfingers!!! AMAZING! One of my fan favorites. I use a low side dish and cut these prior to chilling. You can roll cut easily with a pizza cutter at this point, and then just break them apart (if necessary). I love that idea! Thank you for sharing. That will make it easier to cut. Another great one is to take the candy corn and melt as you describe, mix a jar of roasted peanuts into it, (the ones without the skins) roll into logs, and you have Payday candy bars. Also, if you just put the candy corn and peanuts mixed together in a dish like for mints and peanuts, eating a handful together tastes just like a Payday too. I love that idea! I think I an going to try that! Thank you!! It’s imperative you add caramel bits to make it the real deal! OMG!!!! I love that idea! I’ll try that next time. Thank you! Hi Cheryl, I am so happy they turned out for you. Love the idea of making them into balls. Omg, those look Yummers. I don’t know a soul that don’t like Butterfingers. I’m gonna try making these. Thank you so very much for sharing. Can I use chunky Peanut Butter instead of smooth? I’m guessing you would use a little more than 1cup of the chunky. Thanks! I made these, and I don’t know if I didn’t stir the peanut butter into the melted candy corn well enough, but these turned out SUPER chewy (like almost teeth-breakingly chewy). I chilled them for almost 2 hours in the fridge (not sure it that was too long) and when I tried cutting them, they shattered and were pretty much impossible to cut cleanly. The flavor was totally there, but the consistency was disappointing since they were way to chewy and there was none of the flaky/crunchy texture that you get in Butterfingers. Sad these didn’t work out for me, but great idea flavor-wise! cut them while still warm and refrigerate overnight. i was shocked how the texture was exactly like a butterfinger. I am glad they turned out. Little tip – you should cut the candycorn/peanut butter mix while it’s still warm. Much easier. Also – you do not need to cool in the fridge for an hour. That’s unnecessary. These do not taste like butterfingers!